Home > Latter-day Saint Blog Posts > Why Did Nephi Include the Story of the Broken Bow? Why Did Nephi Include the Story of the Broken Bow? During Lehi’s travel through ancient Arabia, his sons needed to slay animals for food from time to time in order for their group to avoid starvation. Nephi reported on one occasion that he went hunting and broke his bow, “which was made of fine steel” (1 Nephi 16:18). And because his brothers’ bows had “lost their springs, it began to be exceedingly difficult, yea, insomuch that [they] could obtain no food” (v. 21). In response to their dire situation, Laman, Lemuel, the sons of Ishmael, and even Lehi all began to “murmur against the Lord” (1 Nephi 16:20). In contrast, Nephi encouraged them by saying “many things unto them in the energy of [his] soul” (v. 24). He then “made out of wood a bow, and out of a straight stick, an arrow” and went to his father for guidance (v. 23). Lehi humbled himself and consulted the Liahona. It directed Nephi to the top of a mountain, where he “did slay wild beasts, insomuch that [he] did obtain food for [their] families” (1 Nephi 16:31). Although this story may seem rather unremarkable, it may actually be loaded with symbolic importance. 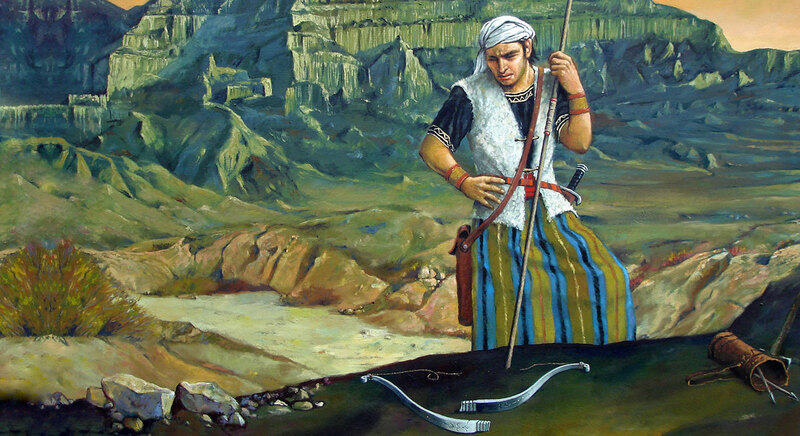 In the ancient Near East, kingly status, military power, and the right to rule were all symbolized by the bow.1 Thus “to break the bow” was a common idiom which meant to bring an enemy or ruler into submission.2 In Nephi’s circumstances, most of the adult males in the group, except for Nephi, murmured and complained against the Lord. It took the breaking of the bow, as well as chastisement from Nephi and from the Lord Himself, before they finally “humbled themselves” (1 Nephi 16:24). 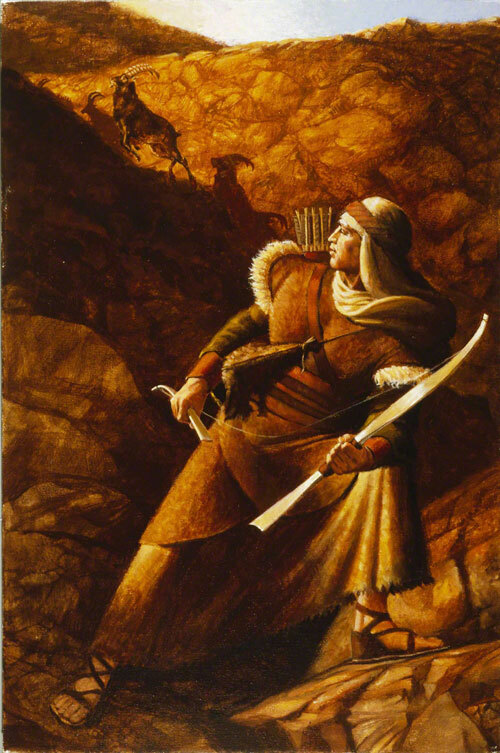 This story, like Nephi’s slaying of Laban, also helps confirm the Lord’s promise that Nephi would be a teacher and ruler over his brothers (2 Nephi 5:19).3 According to Noel B. Reynolds, “What we tend to read as a story of flight from Jerusalem is really a carefully designed account explaining to [Nephi’s] successors why their religious faith in Christ and their political tradition—the kingship of Nephi—were both true and legitimate.”4 Nephi’s newly created bow symbolized that he was Lehi’s rightful prophetic successor. It foreshadowed his future kingship. And it demonstrated that, according to divine appointment, he was taking “the lead of their journey in the wilderness” (Mosiah 10:13). Alan Goff, “A Hermeneutic of Sacred Texts: Historicism, Revisionism, Positivism, and the Bible and Book of Mormon,” (MA dissertation, Brigham Young University, 1970), 92–99. William J. Hamblin, “Nephi’s Bows and Arrows,” in Reexploring the Book of Mormon: A Decade of New Research, ed. John W. Welch (Salt Lake City and Provo, UT: Deseret Book and FARMS, 1992), 41–43. Noel B. Reynolds, “Nephi’s Political Testament,” in Rediscovering the Book of Mormon: Insights You May have Missed Before, ed. John L. Sorenson and Melvin J. Thorne (Salt Lake City and Provo, UT: Deseret Book and FARMS, 1991), 220–229. 1. Alan Goff, “A Hermeneutic of Sacred Texts: Historicism, Revisionism, Positivism, and the Bible and Book of Mormon,” (MA dissertation, Brigham Young University, 1989), 92–99. 2. See Nahum W. Waldman, “The Breaking of the Bow,” The Jewish Quarterly Review 69, no. 2 (1978): 82–33. 3. See Book of Mormon Central, “Why Was the Sword of Laban So Important to Nephite Leaders? (Words of Mormon 1:13),” KnoWhy 411 (February 27, 2018). 4. Noel B. Reynolds, “Nephi’s Political Testament,” in Rediscovering the Book of Mormon: Insights You May have Missed Before, ed. John L. Sorenson and Melvin J. Thorne (Salt Lake City and Provo, UT: Deseret Book and FARMS, 1991), 221. See also, Noel B. Reynolds, “The Political Dimension in Nephi’s Small Plates,” BYU Studies Quarterly 27, no. 4 (1987): 15–37. 5. See William J. Hamblin, “The Bow and Arrow in the Book of Mormon,” in Warfare in the Book of Mormon, ed. Stephen D. Ricks and William J. Hamblin (Salt Lake City and Provo, UT: Deseret Book and FARMS, 1990), 365–399; William J. Hamblin, “Nephi’s Bows and Arrows,” in Reexploring the Book of Mormon: A Decade of New Research, ed. John W. Welch (Salt Lake City and Provo, UT: Deseret Book and FARMS, 1992), 41–43; George Potter and Richard Wellington, Lehi in the Wilderness: 81 New Documented Evidence That the Book of Mormon Is a True History (Springville, UT: Cedar Fort, Inc., 2003), 99–105. 6. Alan Goff, “Dan Vogel’s Family Romance and the Book of Mormon as Smith Family Allegory,” FARMS Review 17, no. 2 (2005): 388. 7. See J. R euben Clark, Jr., “When Are the Writings and Sermons of Church Leaders Entitled to the Claim of Scripture?” Address to Seminary and Institute Personnel, BYU, July 1954: “The Church will know by the testimony of the Holy Ghost in the body of the members, whether the Brethren in voicing their views are ‘moved upon by the Holy Ghost’; and in due time that knowledge will be made manifest.” This statement was quoted in D. Todd Christofferson, “The Doctrine of Christ,” Ensign, May 2012, online at lds.org. Book of Mormon Central : Why Did Nephi Include the Story of the Broken Bow? How Does Prophecy Shape the Book of Mormon’s Content and Structure? Why Was It Significant that Nephi Was Made ‘a Ruler and a Teacher’ Over His Brethren? Aggregated Content Copyright © 2008-2011 by the original authors. Original Content Copyright © 2008-2011 J. Max Wilson. Some rights reserved. www.NothingWavering.org is an individually owned and operated website with no official affiliation to The Church of Jesus Christ of Latter-day Saints. The views expressed here or aggregated from websites or blogs, other than those owned or operated by the Church, are those of the individual authors and do not necessarily represent the official position of the Church. Likewise, the views aggregated from other websites or blogs do not necessarily represent the views of www.NothingWavering.org or its owner.